On Sunday November 20th, individuals and organizations across the globe participated in the World Day of Remembrance for Road Traffic Victims. In Vietnam, thirty birds were released in memory of the thirty lives lost on the country's roads every day. Remembering these individuals is a good reminder of why our work is so important. This month's newsletter describes the event as well as the other activities we've been busy with this November. Ministers of Health approve action plan to reduce traffic injuries - Ministers of health of the Americas have approved a new plan of action on road safety designed to prevent traffic injuries, the leading cause of death in children aged 5 to 14 in the hemisphere and the second-leading cause of death for people aged 15 to 44. INTERPOL General Assembly opens in Vietnam with new member countries expanding fight against transnational crime - INTERPOL's 80th General Assembly opened with a call for law enforcement to remain vigilant to both emerging and traditional forms of transnational crime. The four-day meeting (31 October – 3 November) which brings together some 630 police chiefs and senior law enforcement officials from 142 countries, will address a range of issues including enhanced use of INTERPOL's tools to combat crimes including online sexual exploitation of children, maritime piracy, firearms trafficking and fugitive investigations. Nigerian Ambassador to Vietnam, Hon. Tunde O Ajisomo, has expressed his dedication to translating the lessons learnt from Vietnam's experience with helmet use to the Nigerian context. 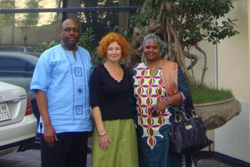 On November 1st, GHVI was invited to meet with the Nigerian Inspector General of Police Hafiz Ringim. They discussed the Global Helmet Vaccine Initiative, some best practices learnt from GHVI's work in Vietnam, and different ways these methods could be applied in Nigeria. GHVI provided some key speaking points and background information on road safety for the Inspector General of Police to take back to Nigeria. Encouraged by the feasibility of the five pillars, Ringim will follow up with the Federal Traffic Safety Council, which operates under his leadership. On November 4th, the Tanzania Inspector General of Police Saidi Mwema visited the Protec Tropical Helmet factory. Following the tour, the need to increase the Tanzanian public's awareness of road safety was discussed. The Tanzanian Bureau of Standards recently drafted a motorcycle helmet standard that is now ready for implementation. This standard is the first step in ensuring that the motorcycle helmets sold in the country are of high quality and able to protect drivers' heads. Road crashes are taking a huge toll on the Tanzanian health budget, not to speak of the human suffering, and the meeting attendees recognized that it is important to act now. Mwema committed to approaching the Prime Minister about the need for increased public awareness about the importance of wearing a safe motorcycle helmet. The campaign, 'On the Head and Strapped On!' was run by Make Roads Safe Hellas in the Greek island of Crete with support from the FIA Foundation as part of the Global Helmet Vaccine Initiative (GHVI). The campaign featured a prize draw for riders observed wearing their helmets correctly. The winners of this innovative competition to promote motorcycle helmets were guests of the Federation Internationale de Motorcyclisme (FIM) at the final round of the 2011 Moto GP series in Valencia, Spain on November 6th. In March of this year, the campaign was inaugurated by HRH Prince Michael of Kent. He strongly endorsed its key message, explaining, "We need to persuade all motorcyclists, but especially young men and young women, often riding as passengers, that wearing a helmet is a real life saver". GHVI calls upon all helmet wearers to always use certified helmets according to national standards. For more information about the conference, visit: www.makeroadssafehellas.com. Hanoi plans to reduce traffic with working hour adjustment - Hanoi has drafted a plan to adjust official working hours in the city to reduce traffic jams, leaving state offices and lower schools with the same hours. Transport ministry sets an example - Transport Minister Dinh La Thang has called on all ministry staff to use buses in a bid to promote the vehicle as the primary means of public transportation. A public awareness campaign focused on increasing child motorcycle helmet use was launched this November by the National Traffic Safety Committee (NTSC), the Ministry of Education and Training (MoET), the National Traffic Police (C67), and the Asia Injury Prevention (AIP) Foundation. The social marketing campaign will be accompanied by strengthened police enforcement, supported by the World Health Organization (WHO). Michelin Vietnam is the exclusive entrepreneur partner sponsoring part of this campaign. 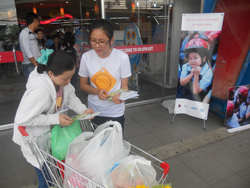 The campaign began with the distribution of flyers in Hanoi, Ho Chi Minh City, and Danang, which refute common myths about child helmet use and detail how to wear a helmet safely. This activity introduces Phase One of a much larger national child helmet campaign, entitled 'Children also need a helmet', which will also include workshops to raise awareness among community leaders and parents. In addition, powerful social marketing messages will be featured in television spots, on billboards and posters, and at a community event. After Phase One, the campaign will extend into a three year operation, all of which will be focused on increasing motorcycle helmet wearing among children by 2014. Click here to see pictures of our flyer distribution. A series of workshops held in Hanoi, Ho Chi Minh City, and Danang in November and December are mobilizing local road traffic safety agents. The workshops aim to inform, and to guide attendees in improving the child motorcycle helmet situation in their cities. 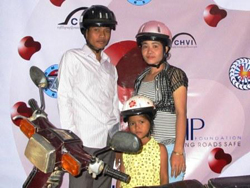 They are part of the first phase of a national campaign entitled "Children also need a helmet". The campaign was launched earlier this month by the National Traffic Safety Committee (NTSC), the Ministry of Education and Training (MoET), the National Traffic Police (C67), and the Asia Injury Prevention (AIP) Foundation. The social marketing campaign will be accompanied by strengthened police enforcement, supported by the World Health Organization (WHO). City officials and road safety specialists are leading the workshops in order to provide attendees with high quality information, an illustration of the government's serious commitment to this campaign at the local level. The first workshop took place in Hanoi on November 12th and instructed 60 parents and teachers how best to protect their children and students, thereby equipping key influencers to be role models and promote responsible road behaviors. In Ho Chi Minh City, a workshop on November 25th mobilized a different group of about 100 road safety agents. In addition to parents and teachers, attendees included police officers, hospital staff members, certified helmet manufacturers, and members of 24 districts' Bureaus of Traffic Safety and Bureaus of Education and Training. A workshop in Danang is set to take place on December 17th. Click here to see pictures of our workshop in Hanoi and Ho Chi Minh City. Two Helmet Handover Ceremonies were held at Phuoc Long and Phuoc Thanh primary schools in District 9 on November 14th and 18th. The events celebrated Intel Products Vietnam's sponsorship of Click on Safety, AIP Foundation's newest road safety education program. Two additional AIP Foundation programs, Helmets for Kids and Safe Routes to School, were also held at the schools. Click on Safety is a computer-based e-Learning curriculum that allows children to experiment with traffic consequences in a fun and risk-free environment. This program is being piloted this year, thanks to Intel's additional donation of a laptop, projector, and screen for each school. 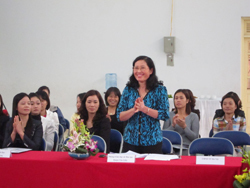 The Handover Ceremony attendees were able to observe a teacher conducting the program with her classroom of students. This year marked the fifth year of sponsorship from Intel Products Vietnam, an accomplishment made all the more notable by their provision of around 320 volunteers from their staff. The volunteers trained the students on proper helmet wearing and played with them throughout the event. 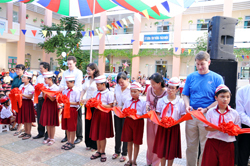 The ceremonies featured the symbolic handover of helmets from sponsor Intel Products Vietnam to the elementary school's students and teachers. In addition to helmets, Intel has donated teaching manuals, traffic safety street models, and traffic signs which allowed AIP Foundation to train the school's teachers on interactive road safety education methodologies. Life-size traffic safety corners were installed in the schools' playgrounds to enable children to practice what they learn in the classroom. On Friday, October 28th, AIP Foundation organized extracurricular activities to reinforce traffic safety knowledge at Phuoc Long Primary school in Ho Chi Minh City's District 9. The activities were sponsored by Michelin. As a follow up to the Helmets for Kids event held last April, non-class activities were organized at both of the school's campuses to refresh the students' memory about what they learned last year, and reinforce their good pedestrian and motorcycle passenger habits. 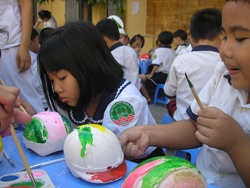 The children painted plaster helmets, participated in traffic safety performances, and competed in a contest which tested their traffic safety knowledge. Michelin donated the helmets in April and sponsored this week's extracurricular activities. Equipped with reinforced road safety knowledge, the students of Phuoc Long Primary School will be safer on the road and help reduce the devastating number of road traffic injuries that happen each day in Vietnam. In Vietnam, where 30 people are lost to road traffic accidents each day, road safety is a pressing concern. On November 20th, events were held in honor of the World Day of Remembrance for Road Traffic Victims. Actress Kathy Uyen and singer Thanh Bui joined AIP Foundation staff as goodwill ambassadors for the second year in a row. They visited Truong Van Thanh Primary School in Ho Chi Minh City's District 9, and had discussions about road safety with the students. After the release of 30 birds, to symbolize the 30 lives lost each day on Vietnam's roads, Uyen and Bui interviewed some local authorities about the causes and consequences of road traffic accidents. Articles in leading national newspapers aimed to increase public awareness of road safety issues and hoped to lead to increased preventative action nationwide. ADB $3mn assistance to help Cambodia meet post - floods devastation- The Asian Development Bank (ADB) has offered to support the Government in putting together an emergency flood rehabilitation project that will focus on rebuilding roads and irrigation systems. Man arrested for smuggling motorcycles across Cambodia border - Police in Thu Dau Mot town of Binh Duong Province arrested 42-year-old Nguyen Tan Hien on October 12 for smuggling stolen vehicles across the border to sell in the black market in Cambodia. In 2010, 47 people died as a result of the Water Festival's chaotic festivities taking place in the street. 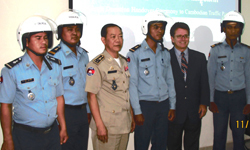 Faced with staggering numbers of road traffic injuries and deaths year-round, the Cambodian National Road Safety Committee (NRSC) and General Commissariat of National Police, Ministry of Health (MoI) are launching a Passenger Helmet Campaign due to begin in the third week of November 2011. The campaign will be implemented by AIP Foundation and aims to increase Cambodia's rates of helmet use, specifically among motorcycle passengers. Preceding the official launch, a series of activities took place during the Water Festival, on November 9th and 10th in Phnom Penh, and the campaign's symbolic logo was exclusively released. At a booth during the festival, LCD television screens broadcasted past social marketing advertisements, documentaries, and a 2010 mini-series entitled "Regrets" which follows a Cambodian family's story after a father and son are in a tragic traffic accident. Several speeches explained the importance of helmets and urged motorcycle riders to wear helmets, regardless of whether they are drivers or passengers, adults or children, or going on long trips or short errands. Last but not least, the Prime Minister's endorsement of AIP Foundation's 2010 Cambodian campaign "One Helmet. One Life." was broadcast on a screen. Educational games were enjoyed by many families, including a road safety knowledge test. Family photos were taken according to the theme "Always Care. Always Wear a Helmet". Twenty five winners of a lucky draw received free helmets. Children and their parents participated in several games where teams competed and showed off their traffic safety knowledge. AIP Foundation and the Ministry of Interior signed a Memorandum of Understanding (MoU) certifying their collaboration on the Cambodian Helmet Vaccine Initiative's campaign projects. At this occasion, AIP donated helmets to Lt. Gen Chan Kim Seng, who symbolically handed over the helmets to five traffic police officers. AIP Foundation, Handicap International Belgium, Medical Teams International, Automobile Association of Cambodia and Coalition for Road Safety (CRY) co-signed a letter to the Minister or Public Works and Transport to request inclusion of all children in the draft amendment of a motorcycle passenger law. The Minister of Public Works and Transport consequently consented to the joint request and advised the Technical Working Group to include the compulsory requirement for children to wear a helmet in the draft amended law. The Cambodian National Road Safety Committee organized a ceremony on November 20th in honor of this year's World Day of Remembrance for Road Traffic Victims. The ceremony took place in Preah Sihanouk province, which was selected because of its high number of major crashes resulting in fatalities. The government of Cambodia is committed to making the national road # 4 (which runs from Phnom Penh to Preah Sihanouk province) safer. AIP Foundation contributed helmets and some financial support to this day's awareness and commemoration events. Phuket tourists in bus accidents – DDPM Phuket had a meeting to analyze the causes of road accidents. Case studies of tour bus crashes were examined and solutions were brainstormed with the purpose of compiling a document to submit to the government. The Meeting noted that there was considerable variation in the completeness and accuracy of road safety data among countries. That notwithstanding, underreporting remained a serious problem in nearly all countries, albeit of varying magnitude. The Meeting noted with much interest the road safety database which Handicap International Belgium had developed for Cambodia in collaboration with the Government of Cambodia and discussed the possibility of the potential application of that and the other databases to developing countries in the region. The Meeting noted that innovative arrangements had been introduced or initiated in many countries for funding road safety improvement initiatives, including through corporate social responsibility and the involvement of non-governmental organizations and the private sector. The Meeting appreciated the launch of the Asia-Pacific Road Safety Network (APRSN), a web-based regional network of stakeholders designed to facilitate the timely and continuous exchange of road safety best practices and other useful information. Uganda Travel And Tourism News: 1,700 People Have Died In Road Accidents Since January - Over 1,700 people have died in road accidents since January this year, according to statistics released by the police. All drivers should be tested - All drivers across Uganda should be examined to curb the high toll of road accidents, the Archbishop of Kampala Dr. Cyprian Kizito Lwanga has advised the Inspectorate of police Maj.Gen Kale Kayihura. Uganda Helmet Vaccine Initiative is planning a communication campaign targeting boda boda (motorbike taxi) drivers and passengers. An implementation plan for the campaign has been drafted, and funds have secured. The campaign will contain workshops for boda boda drivers as well as for local police officers, in order to alert them to the danger of Uganda's road safety situation, and encourage them to wear a helmet, drive responsibly, and follow traffic laws. In addition, a radio campaign and public rallies will be organized. The US Centers for Disease Control and Prevention (CDC), in collaboration with local research partners, will be evaluating all aspects of the communication campaign's activities, outcomes and outputs.